Three gigs in a month is some kind of record for me. Well, yes, actually they were officially Liquorice Allstars gigs, weren’t they? Three different mixtures of Liquorice Allstars, playing three different assorted bags of songs. But I was there, somewhere in the middle, singing with gusto (or do I mean Gafro?) and bashing away on my guitar in an enthusiastic – if untutored – fashion. I guess I’m just a busker (albeit one that has never busked – in the proper sense of the word – in his life). I know about half a dozen chord shapes (no jazz chords), and I’d be lost without my capo. Singing is a really personal thing though, isn’t it? Someone might criticize your guitar playing skills and you’d say “yeah, so what if I’m not the world’s best guitarist?” But if someone is critical of your singing, it’s like them telling you that you’re unattractive or that you smell. Am I? Do I? Don’t tell me, by the way – it’s not polite! You see, ever since my early teens, I always wanted to be a singer in a band. 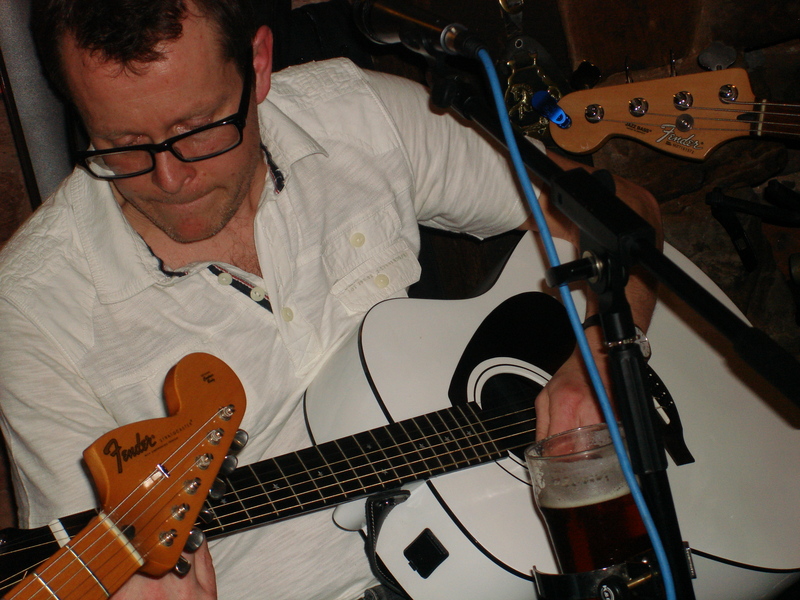 I learned to play guitar to enable me to sing… quite possibly coz no-one would let me sing in their band (the fools!). I don’t practice my guitar playing as much as I should, and maybe it shows. But I do practice my singing (yes, really) and hopefully that has started to show too. I wonder if Neil Young practices his playing or singing? Now there’s a voice that’s an acquired taste. I think I’ve just about managed to acquire it, but it’s taken many years. Ditto Bob Dylan: some great songs, but a terrible voice you gotta admit (and I’ve not yet acquired a taste for his voice). And he’s probably even more of a busker on guitar than I am. But neither of them have done too badly I guess. It’s all about the songs, isn’t it? I should remember that… and get round to flippin’ recording my own. Haven’t we heard that before??? This entry was posted in Live and tagged Bob Dylan, Liquorice Allstars, Neil Young. Bookmark the permalink. God no, I’d never go and see Bob perform! You’re right, he is an icon – unfortunately he’s also a lousy performer (or so I’ve heard – wouldn’t wanna risk my cash on going to see him play). Considered getting tickets for Neil young – he’s playing Liverpool Arena – but figured the missus wouldn’t enjoy it. Now Bowie on the other hand… I’m sure he will tour one day, and I’ll be first in line for tickets. Another icon, only with less cover-able songs. Yes, you NEED to record your own songs! Me & Dave Taylor will be your L.A. session drum God’s from the 70’s – pending of course we can tear ourselves away from that Becker/Fagen project. Suggestion: I think you should name the 3 separate Allstars lineups with slightly different variations; may I put forward ‘Cl!tor!s Allstars’ for the curry-rehearsal band? I can’t imagine being able to get Dave to leave the house! But I really should make an effort to get Gaz and Kitch to learn a batch of my songs, do some demos round here, then maybe book a session in Parr Street, birthplace of Coldplay’s Parachutes. Yeah, I know they’re a bit… whatever now, but I loved that first album. ps, I can’t see us getting many gigs with a name like that, memorable though it may well be! I’ll learn ’em, no problemo. Still love my name variation the best…. I checked out some of the recordings the Stoke studio had made – they were pretty good, but not in the style of acoustic based music that I wanted to record. I was aware that Coldplay did Parachutes at Parr Street, and liked the sound of that album. Plus, it’s local and easy to get to. I got in touch with a chap at the studio to inquire about the total cost for a weekend and whether the price included an engineer. He came back and said the price on the website includes an engineer, but that the price shown was for signed acts – it was considerably less for unsigned acts. He gave me a quote, and I was more than happy to pay the price. I met up with Simon a short while later and said “how do you fancy a free weekend (as in I’m paying for all recording costs) at Parr Street in the very studio that Parachutes was recorded?” Simon, by the way, was also a big fan of Parachutes era Coldplay, so I expected him to bite my hand off (that would be my reaction if someone I knew asked ME if I would like to record in a legendary studio for free). Simon’s response was along the lines of “err, yeah, could do… though I might be washing my hair that day… I’ll let you know.” Those weren’t his exact words, but as you can imagine, I was underwhelmed by his lack of enthusiasm, this being only weeks after him making the suggestion that the two of us jet off to this unknown studio in Staffordshire to record our debut album. I never did find out what had changed his mind. But that was that, end of any pro studio recording adventures for me – it was a window of opportunity (time, money, personnel) sadly closed. Some things are perhaps not meant to be at certain times. I’m convinced things fall into place out of fate. I think though, this music game either destroys your enthusiasm or helps you grow a thicker skin, as and when disappointments happen. These days, I find the little victories (like the minor activities I do with Forty4 or the gig we did at the Hilbre the other week) far outweigh the lifetime of disappointments I’ve had banging my head on musical brick-walls. It’s like positive pay-back time now. I love playing music with people and living it for the moment. Rather that than wonder what might have been – which I’ve done a lot of in the past! “Some things are perhaps not meant to be at certain times” – it gets to a stage when you think it’s NEVER gonna be, which is why I’ve got all my own decent quality recording gear, am proficient on guitar, bass, keyboards and vocals, and have forked out on software and hardware to do the drummer’s job! Recording studios have come into my life three times, including the one described above that didn’t happen. The first time, in the late 80s, in a band with Kitch on guitar, me on bass, Lol Pedley on drums and Steve Kingshot on guitar and vocals, we recorded four songs – one original composition by Steve (“Love on the line” – wow, I still have a long term memory! ), a second original from me (“No laughing matter” – great title still waiting for a song to match), and two covers (Elvis Costello’s “Alison”, Squeeze’s “Messed around”). The session pissed us all off so much, we never played together again. The second time was 1990, in a band called The Big Kiss from Leicester Poly, that had recently reconvened in Watford – in fact, I’d moved to Watford expressly to sign on the dole and be lead singer and songwriter in the band. We went into the studio (can’t quite recall the line-up, but my pal Nick Thomas was co-writer and keyboard player – I’ll have to ask him the details. Oh, and Chris Steele on drums) to record two Big Kiss originals: “Bullet to heaven” (words by G S Smith, music by Big Kiss) and “What you want me to be” (words by C Steele/S Wonder/G S Smith, music by Big Kiss). Not only did we never play again after that session, but Nick – who I shared a flat with – decided that very evening that he would emigrate to the States (his girlfriend Lisa, who also shared the flat, was from California). We all moved out of the flat later that month – Nick and Lisa to West Coast USA, me to West Kirby UK. I’ve clearly had a phobia of recording ever since! I’ve done tons of recording (well, not that much!) but a fair bit to know it all depends on vibe and chemistry between people, plus an ability to put your ego on the coat-stand and play for the song. Ego’s can be collected on the way out home. Again, the more you do this and take the knocks, the harder the shell becomes. Guess I’ve just live a lifetime of musical disappointments to keep going back for more except now I seem to be having better luck when it’s all ‘too late’! But I don’t wanna hard shell, I just wanna record my goddamn songs!!! Since I sound absolutely note perfect and superbly mixed when I sing along to my CDs and MP3s within its confines, I strongly recommend the cab of my (bigger) truck? Clearly it has perfect acoustics….although, on the other hand…. Just recording your songs would be far too easy. Easy never happens in the creative world, unless you surround yourself with the ‘right’ people. Can we hear some music from any of the three studio experiences pls?